Summary: There comes a time in every witch’s life when she must choose her path. Darlena’s friends have already chosen, so why is it so hard for her to make up her mind? Now, Darlena is out of time. Under pressure from Hecate, the Queen of all witches, Darlena makes a rash decision to choose Red magic, a path no witch in her right mind would dare take. As a Red witch, she will be responsible for chaos and mayhem, drawing her deep into darkness. Will the power of Red magic prove too much for Darlena, or will she learn to control it before it’s too late? Review: Jen McConnel knows how to keep the tension high. 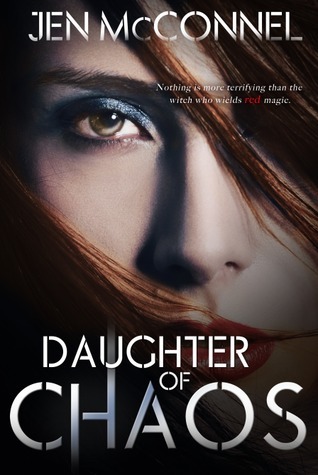 In the novel, Daughter of Chaos, tension is brought on early, with Darlena choosing a path that she didn’t know existed. This focal point is driven throughout the novel, leaving readers almost as desperate as Darlena to find out more about Red Magic. The tension rises more as the life she once knew is taken away from her. Her parents are scared, her friends are misunderstanding, and a plethora of goddesses keep showing up,trying to convince her to use Red Magic their way, but leaving Darlena with more questions than answers. She is frightened and intrigued by the power that she wields, hoping to be able to do good for the world; not just destruction. Her journey for answers takes her farther than she realized she’d ever go.